Hello everyone. So I know when you usually stumble upon my blog my posts are usually light-hearted and happy, and usually based on something fun like makeup or food. But in reality, we go through things much deeper and meaningful, and often times cover all that up with the superficial stuff. It's easier to write about the silly stuff than to open up about the serious/unpleasant issues. Well, all I can say is I'm human. I have feelings and emotions, and often times they are not all happy and positive. I have recently been battling with some depression, and it has proven to be one tough battle. No one ever said life would be easy I know, but no one ever said it would be this tough and painful either. If any of you pray, I'd certainly love if you'd say a prayer for me. I will gladly return the favor for you. It is just like God to give you comfort when you are needing it most. 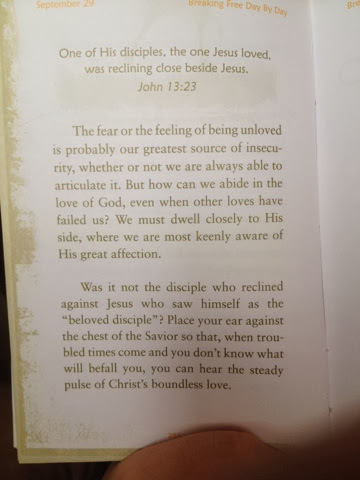 This is a snapshot of the devotional my book fell open to today. It couldn't have been more perfect. God bless each of you today. Are you win over depression at the moment? Have you taken any medications (like lexapro or celexa) to cope with depression? I've always had mild depression and anxiety, but my mental health had rapidly declined that fall.